In bed too late on Sunday morning I thought to myself, “get up now and get on the train otherwise you’ll never do it.” I threw off the covers and threw on my clothes and took myself on a day trip to the Picasso exhibit in Pisa. After printing a train ticket to Pisa Centrale from one of the big green automatic ticket machines I took a few steps and validated it in the small yellow ticket stamper machine and stepped up into the second class train car. A group of four Gabriel García Márquez reading German girls dressed in Renaissance costumes rode across the aisle from me for the ninety minute journey. Pisa is charming. I walked north in a straight line out of the train station doors to the river, stopping once to check a map taped-up in a cafe window to be sure I was heading in the right direction. When I turned around to set off again I was standing right in front of a huge and beautiful Keith Herring mural. I don’t think I have ever seen a piece of his in person. The mural in Pisa is huge, vibrant and delightful, but be careful, it’ll sneak up on you. There were no celebrity paintings among the prints and pots in the temporary exhibit. Maybe paintings don’t travel as well or they were afraid of being stolen à la Mona, but what they had on display was impressive. I was inspired by the levels of detail and gray-scale in the essential bull lithographs and the curatorial wallop of a long hallway of vivid book illustrations dead-ending with this goat’s head. There were a huge series of beautiful copperplate etchings of minotaurs, bull fighters, Bacchanalias, and loungey women that were overwhelming in their number and variety and gave me the sense his balance of skill and production. It was definitely worth the trip. By the time I was out of the museum it was getting dark and chilly. I headed right to the train a little ashamed that I’d return without getting a picture kicking the the tipping tower. But I’d let go of that by the time I rolled into Florence, happy at least that I’d gotten my lazy bones up and out. Kids let loose in a whitewashed room with packs of colored dot stickers and the instructions: put them anywhere. It’s an installation by artist Yayoi Kusama. UPDATE: Here’s a great find. 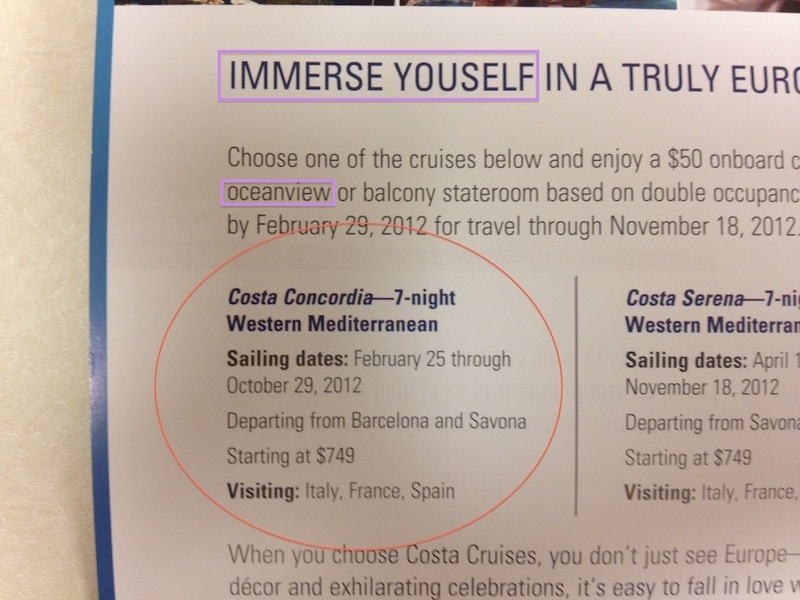 It’s an ad from AmEx for the doomed cruse. Immerse yourself! Something I learned after leaving Florence for the Christmas break was that I haven’t really seen much of the touristy stuff in the city. Now that I’m back I’m committed to seeing more of what’s available here. West from the Ponte alla Carraia, the bridge I cross every morning to school. Gene invited me to the photography museum that houses the Fratelli Alinari collection, apparently the oldest photographic archive in the world. Along with some very beautiful old daguerreotypes and albumen prints from around the world there was a room lined in back-lit negatives and a wild collection of photographic albums, some of them huge sculptural assemblages with metal hinges, gemstone covers and painted edges. I thought the famous Florence lion was a monkey until I was corrected.